Will Miguel Almiron Be Able to Handle the Frenzy of Expectation? – NUFC blog – Newcastle United blog – NUFC Fixtures, News and Forum. When a football-obsessed city breaks their long-standing transfer record, the frenzy around the player in question can be quite overwhelming. Wherever you go in the city, you will encounter someone with an opinion of the player and if you’re looking for small talk whilst riding in a taxi or as the barman pours your pint, just ask them what they make of the new signing. For the Toon, Miguel Almiron is the talk of the town after he made a £21million switch from Atlanta in the MLS. The Paraguayan becomes the player that the Newcastle have shelled the most out for in their history and that brings with it an expectation the 25-year-old would have never before experienced in his career. On top of that, Almiron arrives at a time where Newcastle have done very little in the way of buying players when the transfer market comes around, which may make his job all the more stressful as he arrives at a fan base that are starved as well as giddy with excitement. If you had been walking passed Molineux during the 1-1 draw on the 11th of January, you could have easily mistaken Almiron coming on as a substitute for a Newcastle goal given how loud the roar was from the away end. It was a cameo appearance from Almiron, but there were signs of a player who has the ability to tear the Premier League up. His willingness for the ball and burst of pace makes sure he is always free to receive a pass and when he did get service, he only looked to go one way and that was towards the opposition’s goal at a rate of knots. Almiron’s first job in a Newcastle shirt will be to score or assist the goals that the Toon need to stay in the Premier League. Survival is looking more and more likely, with the Toon at long odds of 15/2 to go down with moplay.co.uk. There are teams in greater danger than Rafa Benitez’ troops but with that in mind, there is still a job to do and very real challenges ahead. 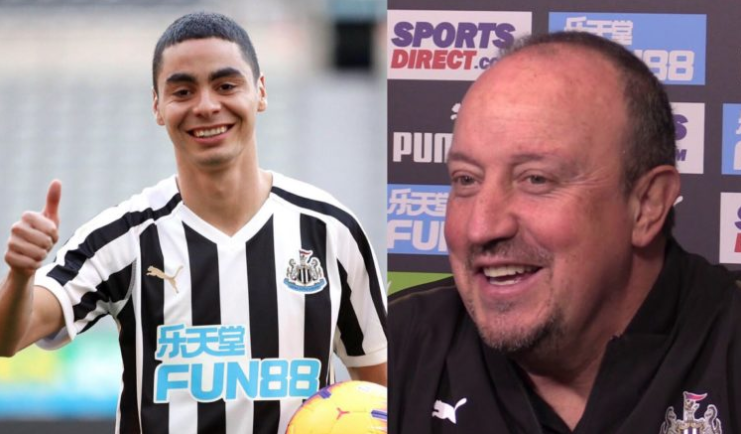 Almiron will be expected to see that Toon survive and not have to wait until anywhere near the last day to secure their top-flight status. Rafa Benitez may give him free rein to focus on getting goals and not defending them given tracking back is not something he has ever been used to, or ever asked to do. Benitez has been quite defensive this season and often come in for criticism for doing so but in some ways, the Spaniard has had to make do with what he has. Now that he has an attacking outlet in Almiron, the 58-year-old may throw caution to the wind in the hope he can throw a six in at least five of the 12 games that are left this season. The city of Newcastle will put their faith in the diminutive Paraguayan to find a way to goal over the closing stages of the season, it’s now over to him to see if he can handle the intense glare of the Toon spotlight.